The six-and-a-half-hour spacewalk is scheduled to begin around 7:10 a.m. EST Sunday when the astronauts switch their spacesuits to battery power and exit the station’s airlock. The spacewalkers plan to install four antennas, laser reflectors and cabling to permit communications with approaching and departing commercial crew capsules being built by Boeing and SpaceX. “We’re going to lay down over 400 feet of cable,” Virts told a reporter Thursday. “These cables are going to attach to some antennas that are going to be used for the future American vehicles that are going to be docking, bringing crew to the space station starting in a few years. During spacewalks last Saturday and Wednesday, Wilmore and Virts laid out some 340 feet of power and data lines needed by two new docking mechanisms what will be installed later this year and made preparations to relocate a storage module and a docking port extension. 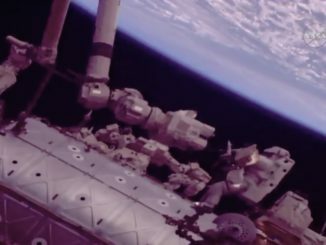 Virts also lubricated the grapple mechanisms on the end of the station’s robot arm. During airlock repressurization Wednesday, Virts noticed a small blob of water floating in his helmet and reported that a water absorption pad at the back of his helmet was damp, indicating seepage through the helmet’s air duct. During a spacewalk in July 2013, Italian astronaut Luca Parmitano endured a potentially catastrophic water leak that forced him to make a quick retreat to the safety of the airlock. That leak was blamed on a clogged filter inside the suit’s water cooling system. 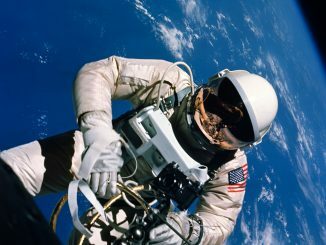 But in Virts’ case, the water intrusion occurred after the spacesuit had been reconnected to a station umbilical and after airlock repressurization had begun. 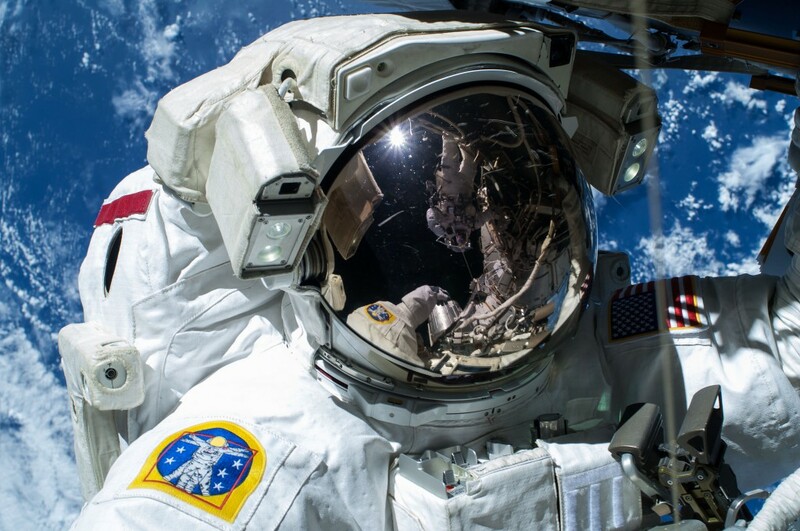 As it turns out that same spacesuit experienced similar incidents after seven previous spacewalks, the result of condensation in the suit’s cooling system after airlock repressurization. Up to 57 milliliters, or about four tablespoons, of “sublimator water carryover” is considered acceptable, far less than what was experienced by Parmitano. In Virts’ case, only about 15 milliliters — three teaspoons — of water made it into the helmet. Speaking to a reporter Thursday, Virts said “I’m completely confident I’m not going outside unless we’re sure it’s a good suit.